· TOS-1X07	What are little girls made of? This first one didn't have William Shattner as the Captain. In fact nearly everyone is different except Spock and there are also bits in B/W! It is lucky that the pilot episode was a good one. You'll also notice Spock smiling when he finds the plant too. I've just started working my way through Voyager season one. I do like the Vidians. I don't know if it was in this one or in the later episode 'The Managerie' (that reused footage from 'The Cage') but I remember a good bit when the physically weak alien is startled when the Captain tries to break the glass wall of the cage with his shoulder. This week’s episode is ‘The Man trap’. I think I saw part of this at least in a repeat run in the seventies on UK TV but no particular scene has stayed with me. 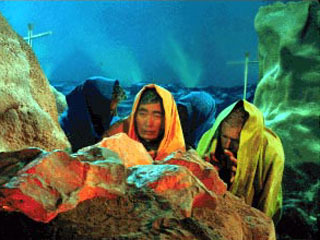 (Won’t write SPOILERS here as it’s 43 years old now) Reading the synopsis on starttrek.com, it is similar to the pilot episode in that alien telepathic power features again, but for the more basic reason of its physical survival. Obviously introducing the characters would be an important function in this first episode proper of Star Trek. Being the last of its race no explanation of the alien species future is needed. Despite it being hideously evil I can still remember having a similar feeling to when creatures on earth become extinct. The simple plot gives plenty of screen time, in comparison with later episodes where the alien situation might be more complex, to describe the leading crew members of the Starship Enterprise. Very interested in what scenes anyone remembers - as they’re usually good ones. I’m hoping, after discussing all these first series episode memories, to watch the first series completely for the first time. This week’s episode is ‘Charlie X’. This is how I remembered it: An gifted young man found in space has to be taken aboard the Starship Enterprise but his eccentric behaviour starts to cause trouble especially with the women crew. There’s a scene where Kirk shouts at him about his conduct and Charlie X gets angry. I then really enjoyed watching it again and seeing Captain Kirk explain to Charlie why he shouldn’t have ‘slapped’ a lady. 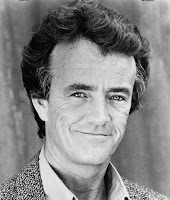 Robert Walker jnr , who played Charlie, has a slight resemblance to Patrick Duffy don’t you think? Blimey, he hasn't changed that much! The City on the Edge of Forever and The Squire of Gothos are my faves! He also portarayed a Klingon in one early episode. I think David Gerrold's The Troubles With Tribbles was the episode! I still have a massive soft spot for Operation Annhialate! Gotta love the evil space pancackes. This Weeks episode is ‘Where No Man Has Gone Before’. I thought this one was a bit less exciting than the others so far, with the 'cowboy fight' type ending down on the planet. Any thoughts? Got two episodes mixed up, so I'll just put them both up this week. This one does have some interesting bits. One of them is certainly when Nurse Christine Chappel gets the virus and is then attracted to Spock, who then is infected and becomes emotional; revealing his human side for the first time. It’s interesting, for me, how the initial characters that we think we know (in this case the logical Spock) can be developed like this. I learnt that Christine Chappel was played by the late Majel Roddenberry, the widow of the shows creator Gene Roddenberry. It seems they were both dedicated to creating and continuing to support their ‘thoughtful entertainment’. It stands the test of time. 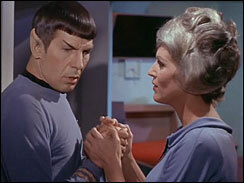 High on the fantasy scale this one, so here's some geeky trivia - Spock first uses the Vulcan Nerve pinch! A scene : Freezing, down on the planet.